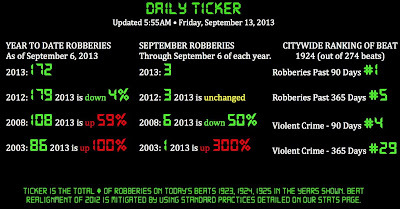 The CWB Daily Ticker is a dashboard of the most up-to-date robbery statistics possible for our neighborhood over the past year, 5 years, and 10 years. As we've often said, our problem did not spring up overnight. It has built and built over several years. Simply comparing this year to last year misses the huge increase that we saw in 2011 and 2012. The dashboard shows the bigger picture. 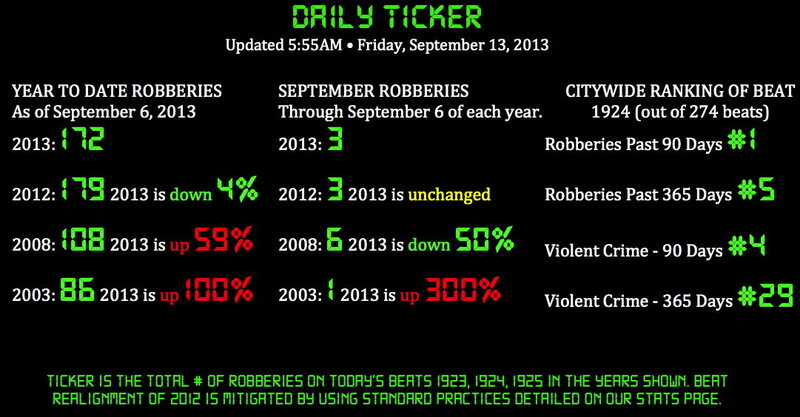 Our source is the city itself, with robbery data taken from the City of Chicago Data Portal. In the event of an outage or update failure at the data portal, information is obtained from the Chicago Police Department web site. The city quarantines crime data for at least 7 days. The complete list of 2013 robberies is here. The complete list of 2012 robberies is here. The complete list of 2008 robberies is here. The complete list of 2003 robberies is here. Beat ranking information is from the Chicago Police Department web site. The city quarantines crime data for at least 7 days. The CPD realigned our area's police beats in March 2012. The lines that divide Chicago police beats literally run down the middle of their shared streets and it is not possible to know with certainty which side of a street crimes were reported on before March 4, 2012. In order to maintain consistency across all years, we have included all robberies that were reported on both sides of the border streets (Irving Park Road, Southport Avenue, and Belmont Avenue) in our calculations. As a result, our post-March 4, 2012, stats may vary slightly from official records. Also, note that very recent crime totals may fluctuate slightly as incidents are investigated and recategorized. These fluctuations settle out fairly quickly.